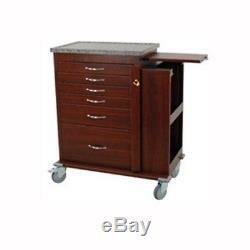 Harloff WV6400SC-CM Wood Vinyl Emergency Cart. Culture change initiatives have increased the interest in wood medication furniture. Hospitals, Long Term Care facilities, Surgery Centers and Clinics can bring the warm appearance of wood to their emergency carts with Harloffês WV line of vinyl-coated aluminum carts. This cart combines the aesthetics of wood with the long-term functionality of a Harloff metal cart. Harloff WV6400SC-CM Emergency Cart Features. Top is MDF covered with a heat-pressed thermal foil laminate. This cart is designed to look like a piece of furniture. Light weight vinyl coated aluminum. Break-away lock bar (wood-look) with 100 break-away seals. Ball-bearing, full extension drawer slides. Side Cabinet (wood look inside and out) with shelving. 5 ball-bearing premium rubber casters, all full swivel, 1 braking, 1 directional. Corner Bumpers (on extended base). Cart is washable with soap and water. Harloff WV6400SC-CM Emergency Cart Specifications. 4 ea _ 3.25 drawers. 1 ea _ 6.5 drawer. 1 ea _ 12 drawer. Assembled Cart Dimensions: 44.5 H x 39 W x 22.5 D. Harloff WV6400SC-CM Emergency Cart Literature. Harloff WV6400SC-CM Emergency Cart Product Sheet. Food and Drug Administration and state and local regulatory agencies. Listing and template services provided by inkFrog. The item "Harloff WV6400SC-CM Wood Vinyl Emergency Cart" is in sale since Friday, June 10, 2016. This item is in the category "Business & Industrial\Healthcare, Lab & Dental\Medical, Lab & Caregiving Furniture\Medical Carts & Stands". The seller is "mfimedical" and is located in San Diego, California. This item can be shipped to United States.